These pendants are smaller and rounder versions of my Pagoda Shaped Geometric Secret pieces with larger flat sizes to show the patterning. I continued using the same pattern as the other pieces to add to my Gaudi inspired series. I also kept the Gaudi inspired colouring. 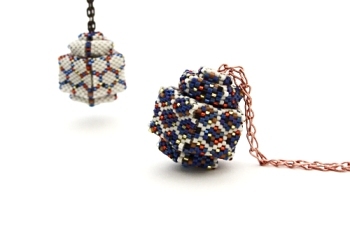 Similar to my first Geometric Secret pieces these are an adaption both in size and pattern.